Near max th11 looking for a good clan. Thread: Near max th11 looking for a good clan. I run an efficient level 13 war clan, we're competitive in war. Solid win ratio and a great track record in cwl. We have an optional discord channel, which we can plan on better. Overall though the mindset is team first and win. As a bonus we max clan games and have a rocking community with some great people. This is a chill atmosphere as a community and a competitive place in war. Worth stopping in! Just as a sample size of our love in war I'm sitting on over 1800 war stars. Most troops and defences are max. Will participate in clan war league, regular wars and clan games. Looking for a good and active clan who participates in clan war league and complete their clan games and do regular wars. Looking to stay.will be active.ty. Looking for a generous donating, family friendly, organized, farming /warring clan? If so, you're in luck, Chicken's Fire is recruiting. We are currently recruiting active th11 and th12 accounts for CWL. Participation in regular wars is optional. Chicken's Fire (#Y0JU9QCC) welcomes responsible players 14+ yrs with town hall 11 and higher. Parents that join can bring their children under 14, but are responsible for ensuring their children follow clan rules. The rules are minimal and are designed to ensure everyone can enjoy themselves while playing. We war twice a week (Tuesday and Friday) and in Clan War Leagues. You can opt out if you don't want to do regular wars but we do encourage members to participate. All members are required to do clan games to ensure we always get the highest tier rewards for everyone. We encourage everyone to donate. Players must be able to communicate in English. We are a member of the Chickens United clan family. If you liked what you read and are interested in joining us please send a request and type "Saw the Forum Post" or similar in the invite request box. Hello. I am Mr. Hammer from Darkness Within. We are looking for some a couple more high level town halls to accompany the ones already present in the clan. Our clan is an active bunch and our donations are quite high. We would love to see some new faces. Please come and check us out, we'd be glad to have you part of the team! Welcome to Black Brain we are a B2B FP Adult Casual War Clan. Which means we take war serious to win because we all want that loot we have a few rules but not over the top and we like to have a casual / respectful environment. Discord is requirement so if you do not use discord or wish to use it please do not apply. 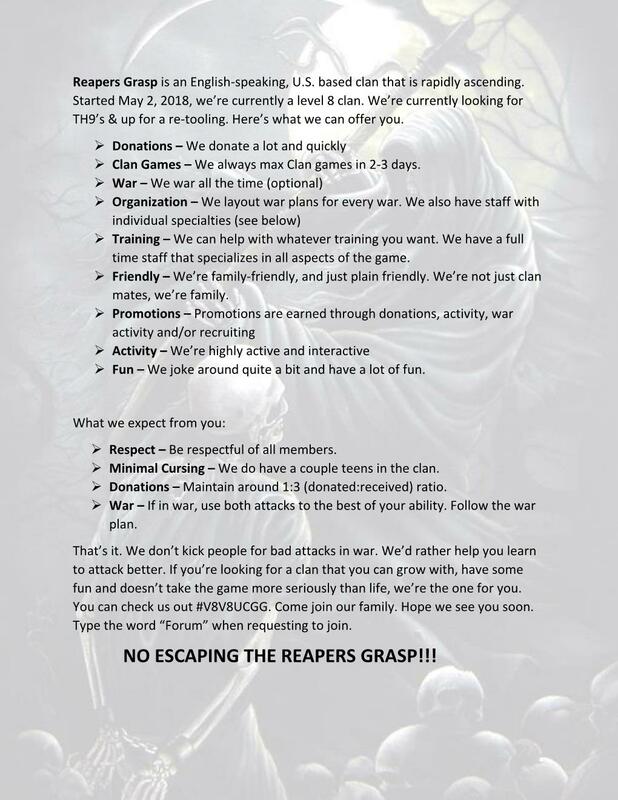 We are looking for like minded players both veterans and new players alike. We want loyal members who want to clash and grow with us. We have players from all over more US based right now though. You are not expected to be perfect in war but we do expect you to try your best and you must use both attacks in war. There’s no such thing as a bad attack if you learn from it and continue to practice. If you are willing to learn or teach than we want you. ◼Having a war timer you will get you rejected. Black Brain #9RJV0CYJ is part of The Big O Family! Casual FP War Clan that also participates in league play. Join our Discord server today to check things out!